The marketing, theatre and facilities departments have collaborated to give the St. Scholastica Theatre building an eye-catching update. 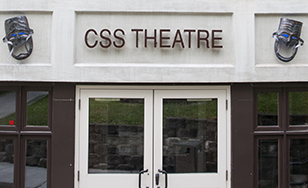 A new "CSS Theatre" sign marks the main entrance, where there previously was no signage on the building itself. The words are flanked by the comedy and tragedy masks that traditionally symbolize live-action theater. The copper masks were custom sculpted by metal artist Kirt Rebello of Massachusetts. He treated them with liver of sulfur to give them a dark patina in order to withstand harsh outdoor conditions without changing color. The letters and masks are all backlit, providing added style and visibility in the dark. Inside the building, the facilities department painted several walls to create a modern, fresh look. Six large new pictures of campus and scenes from previous theater productions were installed, in a range of sizes up to five feet by six feet. St. Scholastica Theatre's 2016-17 season begins at 7:30 p.m. Friday, Oct. 28 with "The Diary of Anne Frank."